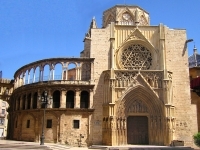 It is reputedly the resting place of the Holy Grail, but whether you believe that or not the ornate Valencia Cathedral is worth a visit just because of its unique history and combination of architectural styles. Since it started out in 1262, it has shuffled back and forth from being a mosque to a Christian church, and has been added to accordingly in a variety of styles from Romanesque to Gothic, Baroque and even Moorish. It houses an interesting museum, treasury and the Holy Grail chapel. Also look out for paintings by Goya. Most visitors, though, make a pilgrimage to the cathedral simply to climb its octagonal medieval tower, which provides a wonderful panorama of the city if you have the staying power to make it to the top of the winding staircase (262 steps!). Climbing the tower entails a small extra fee. The entrance fee to the cathedral includes an audio guide, in multiple languages, which takes tourists to 21 different points of interest in the cathedral and ensures all the highlights are taken in. The square outside the church is lovely, with numerous cafes and restaurants, and is itself a tourist hub. Part of the cathedral is always open for prayer, but tourists are only let in at certain times, according to the service schedule - check the website for opening times to avoid disappointment. Admission: €5 (general); concessions available.